Your investors see hundreds of pitch decks every month. Only the most memorable get a second look. Your pitch deck or investor presentation is one of your most important pieces of early marketing material. A professional pitch deck that impresses investors shortens your fundraising time. Great pitch deck design firms go beyond the pitch deck and capture customer interest and sales. Our pitch experts help you craft meaningful story, create custom visuals that capture your brand in the most unique way, and deliver usable, scalable marketing design. Check out the decks we’ve built that have helped our clients win pitch competitions, win new clients, and raise millions. We’re a team of dedicated pitch deck, startup and design experts that is here to serve you. It’s hard to run a startup, even harder to raise funds. We would like to be your design partners for the pitch deck and beyond. With long-term focused strategic partnering, we work with founders to ensure traction is at the forefront of your investor pitch deck design, investor strategy, marketing, sales, and delivery. That way, you have the most compelling case for funding, and after investment you have strong momentum built to continue your growth. Our strategic design team unites sales, marketing, and delivery so you are on message and on target with your execution today.  Our pitch deck quick start guide will help you to jump start the process of putting together your pitch deck. Whether you are seeking funding, are attending a pitch competition, or if you just know you’ll need a pitch deck for your startup soon, this guide is for you.